The F/A-18, which is perched atop a 28-foot-high pedestal, is on loan from NASA’s Dryden Flight Research Center at Edwards Air Force Base. 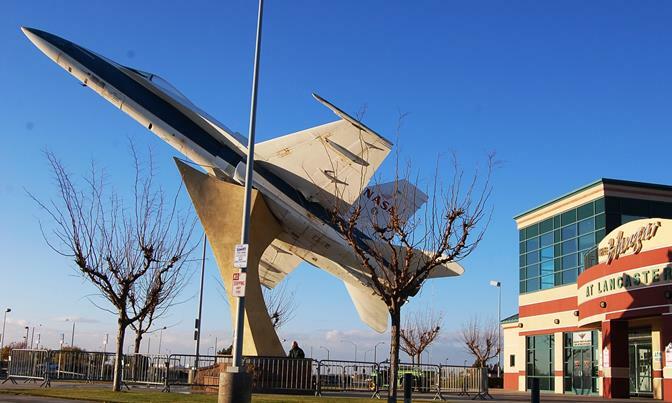 LANCASTER – The City of Lancaster on Wednesday announced the upcoming redesign and modernization of the F/A-18 Hornet display and supporting pedestal located in front of the Lancaster Municipal Stadium. The F/A-18 Hornet will be taken down from its mounting by mid-December and transported to NASA’s Dryden Aircraft Operations Facility in Palmdale where the restoration will be performed. The F/A-18, which is perched atop a 28-foot-high pedestal, is on loan from NASA’s Dryden Flight Research Center at Edwards Air Force Base. As the 11th pre-production F/A-18, the single-seat “A” model jet was at the end of its flying life and had been retired when it was installed in front of the stadium in March of 1997. NASA Dryden had obtained the developmental aircraft in 1987 to use as a mission-support or “chase” aircraft, meaning it was used by Dryden’s pilots, engineers and photographers to observe other research craft in flight and shoot video and photographs of test flights. Lancaster city officials will be working with NASA Dryden officials to assure the safe and timely process of redesign, modernization and reinstallation in front of the stadium occurs by the beginning of the upcoming Lancaster JetHawks season in early April. “Our proud aerospace history is not only a unifying force throughout the Antelope Valley, but throughout all of California,” said Vice Mayor Marvin Crist in a city news release. 3 comments for "FA-18 Hornet display to be redesigned"
Just like so many other historically significant places and things throughout this valley, they can’t keep themselves from trying to modernize and uglify everything. Lancaster and Palmdale are both guilty. So, according to parris we have a “proud” history of aerospace in the valley. I find it a typical insult & slap across the faces of our veterans, who are obviously relegated to the “back of the bus”. Some folks are aware of the fact that the plane flown by the honorable Pet Knight was restored & readied by volunteers to be placed on a pedestal for display at the Veteran’s home on ave I. However, that has not happened for over a year now & seems to have been thrown into the trash bin due to juvenile type infighting & the hell with doing something for the Veteran’s home, but we will surely do everything we can to shine up the display at a sports facility! Disgusting! They should make steam come out the back jets after the game if the Jethawks win.